Our beautiful birch Brittany Needles. Why buy Brittany needles? Probably the best reason has to do with the benefits of wood. Wood is warm, smooth and soft. It won't drain heat from sensitive fingers the way aluminum and plastic needles do. We have many comments from arthritis patients and their doctors that they wouldn't be knitting if it weren't for wooden needles. Birch is a superior wood for this purpose, its tensile strength and stability maintains size, resists warping and allows for smoothness of finish no other needle can provide. Wood is our greatest renewable natural resource. It is environmentally friendly; it's recyclable, biodegradable and durable; when it is no longer needed it can be returned to the earth. All wood used by Brittany comes from strictly regulated forests or small woodland owners in the United States ensuring proper environmental logging practices and selective cutting for maximum reforestation. Nothing helps a project move along like the right pair of knitting needles. 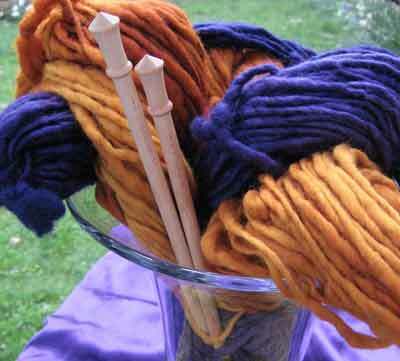 We specialize in wooden, or bamboo knitting needles, because of their tactile feel, their ability to help yarn stay on the needle (especially SILK!) and the fact that are warm to the touch. Our Brittany Needles are especially elegant with their faceted tops. Easy on the hands and eyes, we carry Brittany and Clover Knitting Needles, plus gift and compact knitting needle travel sets.